FTE Engineering prides itself on staying one step ahead and has recently introduced a new service so as to better suit your hydraulic needs. We now have a fully equipped Mobile Hydraulic Service to cater to the South West Region of Western Australia. Our mobile unit offers a 24 hour, 7 days a week service and is operated by our fully qualified hydraulics expert. 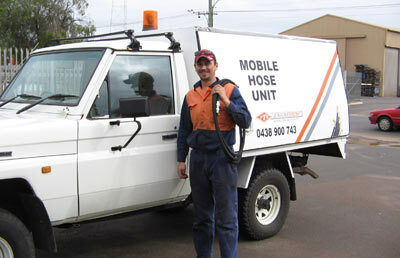 FTE Engineering’s Mobile Hydraulic Service carries many different parts and hoses and we offer an on the spot service. We will endeavour to solve your hydraulic problem onsite or advise you of the best possible solution to your problem. If you require more information on FTE Engineering’s Hydraulic Mobile Service, please do not hesitate to contact our Administrations Office on (08) 9754 4777 or use our website contact form.